For instantly sleek and glossy styles. With argan oil. Does sleek, glossy hair feel like a distant dream? 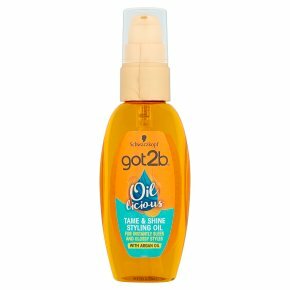 Make it reality with got2b oil-licious tame & shine styling oil. The non-greasy formula with Argan Oil absorbs instantly and can be used for: 1) extra care pre-washing, 2) better manageability pre-styling (damp hair), 3) sleek finished styles (dry hair). Journey to hair oasis! Directions: Use sparingly (1-2 pumps) on towel-dried or dry hair on the mid-lengths and tips. Protect from sunlight.